The location is simply superb! The service is also very good. Our toilet was jammed and they fixed it right away. I also ordered some things online to be delivered to the hotel and they handled it perfectly. The 24hr coffee and location which is very close to China Town. The bed was comfortable. 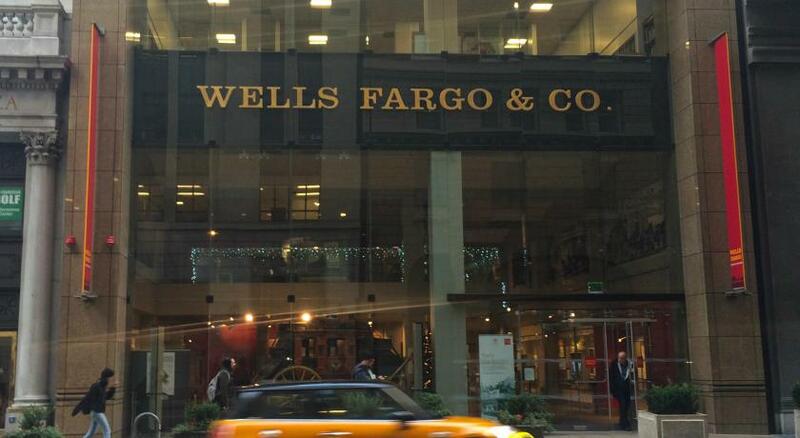 Excellent location near Union Square. Friendly and helpful staff. Attractive and clean rooms. A very fine hotel with a more affordable price than nearby hotels. Would prefer less touristy area. Mostly just dept. Stores. The location was pretty close to the venue that I was training at. Location. Hotel was steps from the Chinatown Gate and an easy walk to catch the cable car to the wharf for chowder. Customer Service. They provided an umbrella and checked online confirming my flight was on time. Location very good. Easy to go every where from this hotel. Coffee and lemon water was available. Area is perfect for wandering. Hotel is in the heart of the "action". Staff was friendly. Room was clean. The room was clean (which is a top priority for me). 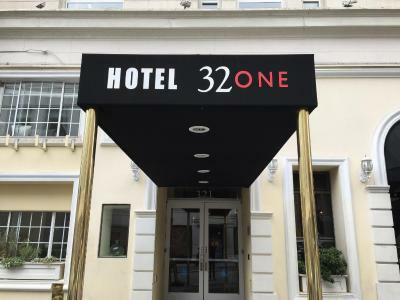 Hotel 32One This rating is a reflection of how the property compares to the industry standard when it comes to price, facilities and services available. It's based on a self-evaluation by the property. Use this rating to help choose your stay! Adjacent to the landmark Dragon Gate in San Francisco's historic Chinatown, this hotel offers guest rooms with free WiFi and a 24-hour reception. 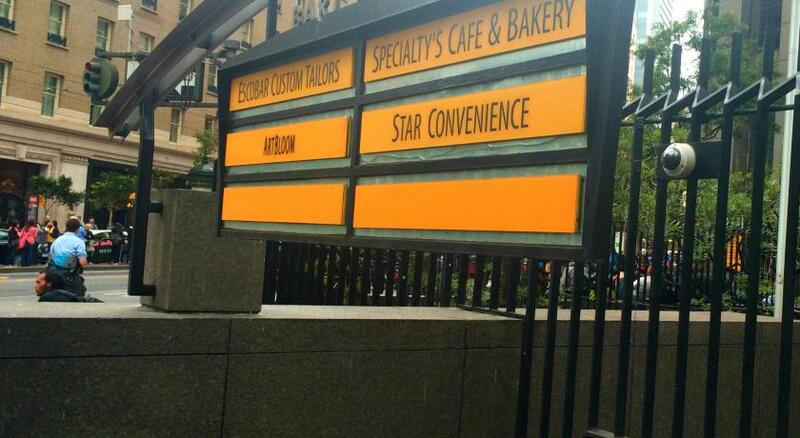 Shopping and dining opportunities in Union Square are just 4 minutes’ walk away. The charming guest rooms at Hotel32One include a flat-screen cable satellite TV and a private bathroom with free toiletries and a hairdryer. The hotel provides free coffee and tea in the lobby area as well as an on-site snack and beverage vending machine. San Francisco International Airport is 40 minutes’ drive away from Hotel32One. Grace Cathedral is 12 minutes’ walk away. The city's famous cable car system is also within walking distance and provides instant access to many popular areas. When would you like to stay at Hotel 32One? Boasting free WiFi, this charming room features a flat-screen cable satellite TV. Private parking is available at a location nearby (reservation is not needed) and costs USD 50 per day. Boasting free WiFi, this charming room features a flat-screen cable satellite TV and a ceiling fan. Offering free WiFi, this disability access room features a flat-screen cable TV and a private bathroom. Looking for a hotel that has easy access to some of the most famous attractions in San Francisco? 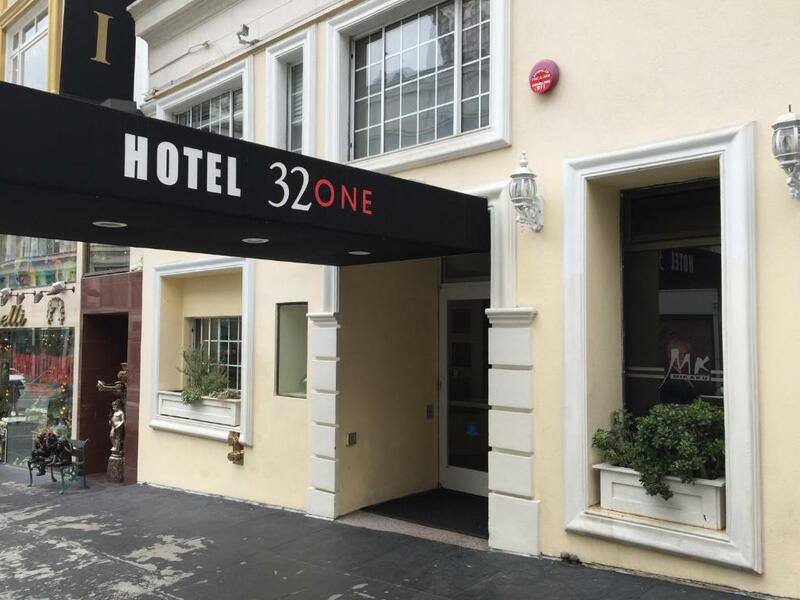 Well don’t forget your walking shoes because you have found a perfect place to stay in SF with Hotel 32One. Located in The Heart of the City by The Bay, you will find that our hotel is within walking distance to Union Square and several art galleries and history museums that are a must see while visiting San Francisco. Chinatown, Fisherman’s Wharf, The Embarcadero and so many of SF’s top attractions are all at your doorstep when you stay at Hotel 32One. Our friendly staff looks forward to providing you with a comfortable and accommodating stay at our affordable luxury boutique San Francisco hotel. Each room has a flat screen TV, work desks, free WiFi, and all the amenities to make your stay stress-free. Don’t forget to get a quick cup of coffee or tea, which can be found in the lobby, before heading out and starting your day! House Rules Hotel 32One takes special requests – add in the next step! Hotel 32One accepts these cards and reserves the right to temporarily hold an amount prior to arrival. Upon check-in government issued photo identification and valid credit card or cash deposit is required. If you late cancel, modify your reservation or don't show, taxes are applicable to the consequential fees (see Hotel Polices). When booking more than 5 rooms, different policies and supplements will apply. We were on the upper floor and there was no Hot water in the shower - it was warm, but not hot. There is no possibility to have breakfast or eat something. Free coffe and ice but no possibility to buy another thing different than water. Not even a vending machin for snacks, beverages or something else. The bathroom we had was a little lacking, to say the least. The sink was way too small and the water pump was so close to the wall it was very hard to use it. The bathtub was also old fashioned and very clumsy since it had curtains all around it. Friendly staff and it's good location. Near conference center and shopping area. It's also relatively near the pier. Managed to walk to and along the pier, and also managed to cycle to San Francisco Gate on the last day. When I booked this,I read the reviews BUT the reviews aren't accurate at all and one would have to question the validity of the reviews themselves. What some of the reviews say is actually NOTHING like the hotel actually is. Where to start. The room had a musty smell even though the window was open and the room was airing. The bathroom vanity was very unhygienic. The cap had come off the overflow outlet and dirt and basic filth was around the exposed outlet. The main drain itself also had dirt around the waste outlet. One would have to wonder if the reviews are actually genuine... This hotel is NOT worth the money paid. My room was a little small, but it is SF. The place has a coffee and water station which was pretty nice. I also appreciated the apples in a bowl they have at the front desk. It also has good security as you have to swipe your card at the front door to enter. 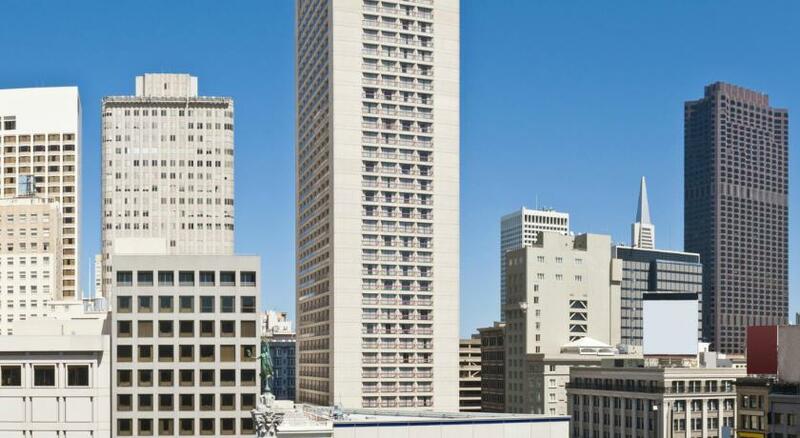 Perfect location for a business trip - close to our office and to the Moscone center. Right next to Chinatown and many good places to eat. Cosy rooms with comfortable beds. Charming old building as many other SF hotels in this area. Free wine tasting everyday around 6pm. The rooms were tired and noisy. The heating did not heat but rattled throughout the night No tea or coffee facilities in the room. The water fr bath leaks out & wet the bathroom.. Water do not flow out properly. Complimentary coffee, tea, wine n apples. Wine is only available on Wed to Sat fr 5 to 6 pm. Would be great if provide some biscuits or cookies. Old hotel, small room. Boring area.